I have never been a flower gardener, that is, until this year. I have been living across the street from a master gardener who has the most beautiful flowerbeds, lawn, shrubs, and vegetable garden which make her house look so bright and well taken care of. Then there is my home. My lawn is infested with weeds, my rose bushes have always been diseased, there isn’t any color around my house except for the gaudy purple paint that adorns it, (yes, I did say purple). So this year I started asking my neighbor questions and she has happily been showing me the ropes (I imagine there would be the benefit of not having my ugly house to look at). One of the things she showed me was how to dry Marigolds so that next year I can plant hundreds of them for absolutely free! 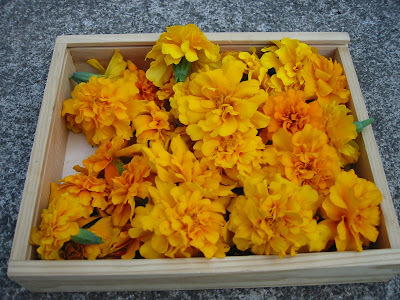 The first step, of course, is to find someone with a lot of Marigolds and then offer to deadhead them once a week or more so you can get a supply started. 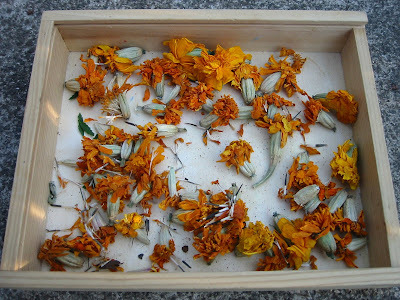 The trick to harvesting many Marigold flowers is to begin deadheading them from the moment they start to flower. This, surprisingly, will cause them to go into hyperdrive and start growing thicker and bigger and produce more flowers. It only takes a couple weeks of deadheading them prematurely and then you can start just deadheading them when the flowers are fully opened. Next; lay them in a container so they can dry. A fruit flat works great. I, however, have been using mine constantly this summer. It takes only a few days before they are dried so you can keep piling the flowers on top of the dried ones. Once the flowering season is over, simply place your container somewhere with air circulating, such as anywhere in the garage just not inside a box or closet, and wait until next spring. When spring comes you simply break the flowers apart between your fingers and plant the long seeds wherever you would like some hardy, bright, punches of color. Be sure to water well. The best part of Marigolds is that it is a natural insect deterrent. I have not had any problems with insects near my tomatoes or carrots, which is where I planted the Marigolds. Next, I want to try drying my own vegetable seeds. The possibilities are endless! Thanks for your post about the marigold seeds. 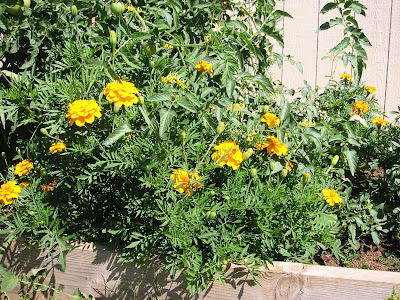 I really want to share with you a way of harvesting marigold seeds that I discovered quite by accident a few years back when I was living in the Rogue Valley in Southern Oregon. I used to do it the way you describe, but one summer I got really behind in deadheading the spent flowers ( I didn't do it before they withered and send them into overdrive because I already had about 1/8 of an acre's worth!) Anyway, when I finally found the time to clip the long-waiting dried heads, the seeds had pushed their way up and were sticking out of each flower about 1/2 to 3/4 of an inch in a perfect, tight little bundle. All I had to do was grab each neat bundle and dump them in a jar. Deadheading was almost unnecessary at this point in the season, but you get the idea… I had literally pounds and pounds of seeds that I gave away and even sold on eBay. My father-in-law had taught me your method, so I wanted to "spread his seed" as far as I could into others' gardens across the country as a legacy to him after he passed away. I even made packets with planting instructions that I gave out at his funeral when he passed away. So, I hope you enjoyed sharing my walk down memory lane. I have a MUCH smaller and shaded yard here in Gresham and am CRAZY about Nasturtiums nowadays. Thanks for your GREAT BLOG as well as generosity with all you know and discover about things Frugal! look into heirloom seeds if you want to use your veggie seeds the next year! I have been keeping as many of my seeds as possible over the past few years. I have a bucket of sunflower seeds, bags of daisy and echinacea heads drying out, and I am running behind on getting the seeds off of the last bunch of spinach. It's great, and I love to give them out to friends, as well.